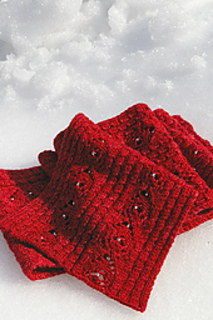 Every girl needs a little sparkle on a dreary winter’s day – a lavishly stitched sock yarn scarf studded with little “ice crystals” is just the thing. 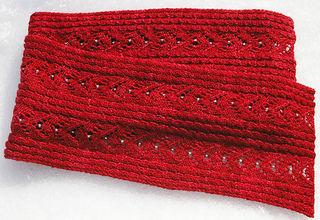 Perfect for a Valentine’s Day jaunt on the skating rink, or an elegant Christmas Party, the Scarlet Sparkler Scarf features a reversible pattern of baby cables, chevron lace and twinkling beading. Pattern blocks are given in chart and written form. Experience with lace, twisted stitches and beading helpful. First example is worked with two skeins hand-dyed sock yarn and it is recommended that you alternate skeins if using a similar hand-dyed yarn.